Posted by rogerhollander in Israel, Gaza & Middle East, Saudi Arabia, Saudi Arabia. 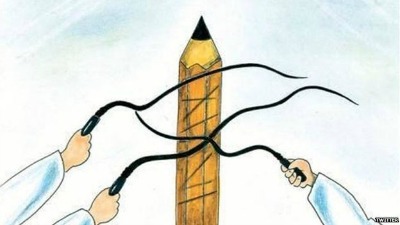 Badawi was publicly flogged with 50 lashes on January 9 in Jiddah, the start of a 10-year, 1,000-lash sentence for “insulting” Islam with his website Free Saudi Liberals. Badawi’s lawyer was also sentenced to 15 years in prison. Last week, his scheduled flogging was postponed for the third time, reportedly for health reasons. His wife, who with their three children has been granted political asylum in Quebec, says his health continues to deteriorate. The ongoing movement to free him has included protests in Europe and Canada, social media campaigns by Amnesty International and Reporters Without Borders, and an open letter from 18 international Nobel laureates to Saudi academics urging them to condemn Badawi’s punishment and the repression it represents. Last week, the new Saudi regime released a royal decree offering pardons to some prisoners convicted of “public rights” charges – pardons that usually require giving up the right to free expression – but it’s unclear if Badawi was among them. And this week his case, which had been referred to the Supreme Court in December, got sent back again to the Court of Appeals. Amidst the legal maneuvering, two members of the Norwegian Parliament, Snorre Valen and Karin Andersen, have nominated both Badawi and his attorney Waleed Abu al-Khair for the Nobel Peace Prize, arguing their longtime “commitment (to) challenging the suppression of free thought, speech and expression in a peaceful manner… should be recognized and embraced…as a beacon of light for those who crave more liberties in one of the last functioning theocracies in the modern world. Their announcement in a Change.org petition quickly garnering several thousand signatures. Badawi also received a dramatic expression of support from seven American intellectuals, academics and activists, including Jews and Muslims, who are members of the U.S. Commission on International Religious Freedom. 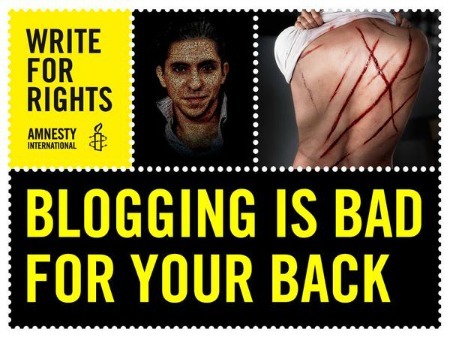 In an open letter to the Saudi ambassador in Washington, DC, they sorrowfully urged Saudi officials to “put a halt to this grave injustice.” But “if your government will not remit the punishment of Raif Badawi,” they said, “we respectfully ask that you permit each of us to take 100 of the lashes that would be given to him.” They were offering “to present ourselves,” they add, because “compassion, a virtue honored in Islam as well as in Christianity, Judaism, and other faiths, is defined as ‘suffering with another.’ We are persons of different faiths, yet we are united in a sense of obligation to condemn and resist injustice and to suffer with its victims.” One member of the group stressed he only signed the letter once he felt “genuinely committed” to going through with taking the lashes, meaning he had to ponder “what it means to sacrifice for others in the fight for justice…What does it mean to say, ‘Inasmuch as ye have done it unto one of the least of these my brethren, ye have done it unto me’”?